Geek's Guide to Britain The world's highest railway is the Xining-Golmud-Lhasa railway at 5,068m (16,627ft) above sea level and running 815km (506 miles). As much a political piece as a transport corridor, the line was designed to fuse China with Tibet – the country the People's Republic invaded and annexed in 1950. Britain's highest railway is nowhere near as controversial, nor as high or long. 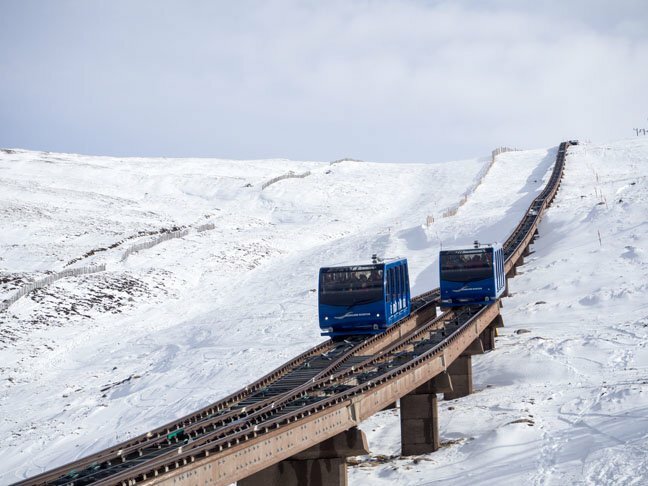 It's the 2km (1.2 miles) Cairngorm Mountain Railway, a funicular operating at up to 1,097m (3,599ft) above sea level – the highest station – on Britain's sixth highest mountain. Passengers are winter-sports enthusiasts and hill lovers as this line has been serving the Cairngorm Mountain ski resort, a few miles to the east of Aviemore, since 2001. That might sound tame, but the conditions in which Britain's tallest railway line operates are far from it. The Cairngorms climate is among the most severe in the UK with a tendency for low temperatures and high winds. A national park since 2003, the Cairngorms hold the national record for strongest gust: 150.3 knots (173mph) on Cairn Gorm Summit, March 20, 1986. Such is the ferocity that this railway employs a gauge of more than two metres (6'6") to help keep it stable in the unrelenting winds, putting it among the widest funicular railways in the world. This being an alpine environment, the railway traverses some rather rare and protected terrain – all of which demanded particularly painstaking attention during the line's construction. Railway and mountain are 2.5 hours by car from Glasgow and Edinburgh and an hour's drive from Inverness. Even if you're not a skier it's worth a trip. En route, it's well worth stopping at Loch Morlich – a beautiful lake nestled among the peaks. Morlich was once home to the Norwegian Independent Company 1 (Kompani Linge) as they trained for commando operations in occupied Norway during the Second World War. A small display of items and information about the force is kept at Glenmore Visitor Centre nearby and is free to peruse. Visitors tend to be surprised to discover a welcoming sandy beach, one so well-regarded that it won a coveted Seaside Award Blue Flag, despite being beside a freshwater loch at an altitude of 304m (1,000ft). Driving on, you soon find yourself climbing above the forest and on to exposed hillside. Scotland's ski resorts flourished in the second half of the 20th century and as visitor numbers increased it became all the more important that they be catered for safely and securely. At Cairn Gorm Mountain, skiers would have once parked at the base station (more than 609m – 2,000ft – above sea level) before taking the White Lady chairlift higher up the mountain. However, the winds that relentlessly lash the region took their toll on the lift and the maintenance required to keep her running became too much – around half of all working days were lost to poor weather. The suggestions of a cable car or gondola had some merit but those same high winds can make such methods of transport extremely uncomfortable for passengers, even if the system itself is safe in the conditions. The idea of a funicular railway on the mountain was first mooted in 1992 but the scale of the project and the sensitivity of the ecosystem ensured slow progress. The theory behind a funicular railway is simple: two cars, counterbalanced against each other, are driven along a track by an external power source. The tendency to build funiculars in steep environments rarely grants the builders the luxury of simplicity, however, and the Cairngorm Mountain Railway was no exception. With only nine mountains in the UK over 1,219m (4,000ft) – Cairn Gorm being one of them – the number of true alpine ecosystems on our island is extremely small. Far-reaching ecological studies probed every aspect of the plans, which continually evolved in an effort to balance convenience for visitors with the survival of the mountain's ecosystems, both during construction and in the future. A petition against the development was raised by both the Royal Society for the Protection of Birds and the World Wide Fund for Nature. Detailed working plans to protect the environment were drawn up and confirmed by Scottish Natural Heritage and the concerns were ultimately overruled by the courts. Nonetheless, they helped shape the way the mountain is operated and monitored today. With an agreed budget of about £15m, once the bulk of construction and conservation details had been finalised, preliminary groundwork began in 1999 with ski-lift specialists Swiss-Austrian Doppelmayr at the helm. Doppelmayr was a member of the consortium that built London's 1km (0.62 mile) pan-Thames Emirates Air Line cable car that opened in 2012. Despite the huge undertaking ahead, one of the first major tasks was relatively sedate. Before so much as a single spade had been sunk into the thin soil, huge quantities of reference photographs were taken. One of the key stipulations of the planning approval was that, once construction was complete, the ground around the railway had to look as close to its original state as possible. Huge amounts of vegetation were carefully dug up and moved to safety in specially built nursery areas, while even large stones were photographed so as to be replaced in the correct position.